Poor Remi got a huge tick in his ear. I discovered this when I went to bring his right ear forward to bridle him. Like a good, level headed Metal/Earth(Yang Ming) horse temperament he simply held his breath and turned his head slightly as I touched the painful ear. On the other hand, a certain Fire Horse temperament mare of mine had a different reaction last time she had a tick in her ear. When Cerise had a tick in her ear she jerked backward when I unknowingly touched it and got away from me. She then ran between the trailer and my friend’s horse that was tied causing her to set back. It was a rodeo. I have since started using blocker tie rings whenever I tie anyone. When I noticed Remi’s pain reaction I looked in his ear and saw the tick. I did not want to sedate him but knew I needed to get the tick out. It took about 10 minutes for him to trust me to pull it out. I then decided I needed to check down in both ears to make sure there were not any more ticks. I did not want to aggravate Remi since he had been so good to let me get the first tick out so I decided to use treats. As a Yang Ming horse temperament, food in important to Remi. I sure enjoyed the look on his face as he contemplated his options. He could let me put my fingers in his ears and get treats or he could resist and not get treats. I gave him a little bite every time he relaxed and brought his head slightly my way. Within 5 minutes I had dug my fingers deep in both ears and luckily found no more ticks. 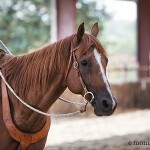 To get a great understanding of horse temperament check out our online course. This entry was posted in Cerise & Remi, Five Element Personality Typing, Five Element Training, General Horse Care and tagged horse temperament on August 1, 2012 by Madalyn Ward, DVM.